Background: Hydrogen gas inhalation (HI) ameliorates cerebral and cardiac dysfunction in animal models of post-cardiac arrest syndrome (PCAS). HI for human patients with PCAS has never been studied. Methods and Results: Between January 2014 and January 2015, 21 of 107 patients with out-of-hospital cardiac arrest achieved spontaneous return of circulation. After excluding 16 patients with specific criteria, 5 patients underwent HI together with target temperature management (TTM). No undesirable effects attributable to HI were observed and 4 patients survived 90 days with a favorable neurological outcome. Anoxic neurological injury is a significant source of morbidity and mortality in patients with post-cardiac arrest syndrome (PCAS). Although a growing body of evidence suggests that target temperature management (TTM) is important for improving neurological outcomes,1 TTM requires significant human and material resources and can only be performed by experienced teams in the intensive care unit (ICU).2 We have been looking for widely applicable therapeutic approaches for PCAS. Recent proof-of-concept studies in animal models have demonstrated the therapeutic effect of molecular hydrogen (H2) on neurological outcomes after cardiac arrest (CA).3,4 In this study, we sought to evaluate the feasibility and safety of H2 inhalation (HI) for PCAS. The study was an open-label, single-arm, prospective intervention trial performed at Keio University Hospital in Tokyo, Japan. The study protocol was approved by the Ethics Committee of Keio University. We consecutively enrolled 5 patients who met the inclusion/exclusion criteria between January 1, 2014, and January 19, 2015 (Figures A,B): 3 of the patients (60%) were male, and the average age was 65±15 years. Collapse was witnessed for all patients; 4 patients (80%) had received bystander-performed cardiopulmonary resuscitation, 4 patients (80%) were initially in ventricular fibrillation, and 4 patients (80%) had a cardiac etiology. The time interval from collapse until return of spontaneous circulation (ROSC) was 16±4.7 min, and the time from ROSC until the initiation of HI was 4.9±1.2 h (Table). Written informed consent was obtained from a legal surrogate and from each patient who regained the necessary mental capacity. Comprehensive PCAS care was provided according to guidelines.5 All patients were successfully treated with TTM between 33℃ and 36℃. Patient selection and system of HI therapy. (A) Inclusion and exclusion criteria. (B) Flow diagram of the patient selection process. (C) Regulated oxygen from the ventilator was mixed with gas from a cylinder filled with 4% H2 and 96% N2 at the end of the inspiratory duct. To ensure safety, we installed the monitoring devices (oxygen, ventilation, and hydrogen concentration monitor) in the respiratory circuit for inspection of the actual composition of the mixed gas during the administration. (D) To administer 2% H2 while maintaining normoxia (avoiding hyperoxia) and normocapnia in patients, we measured the composition of the mixed gas and predetermined the flow rate of the gas from the cylinder in 12 different combinations with a designated tidal volume, respiratory rate, and FiO2. CPB, cardiopulmonary bypass; CPC, cerebral performance category; FiO2, fraction of inspiratory oxygen; GCS, Glasgow Coma Scale; HI, hydrogen gas inhalation; OHCA, out-of-hospital cardiac arrest; PCAS, post-cardiac arrest syndrome; ROSC, return of spontaneous circulation. AE, adverse event; AMI, acute myocardial infarction; CAG, coronary angiography; CPR, cardiopulmonary resuscitation; GCS, Glasgow Coma Score; HI, hydrogen gas inhalation; HOCM, hypertrophic obstructive cardiomyopathy; NSE, neuron-specific enolase; PCI, percutaneous coronary intervention; ROSC, return of spontaneous circulation; VF, ventricular fibrillation. 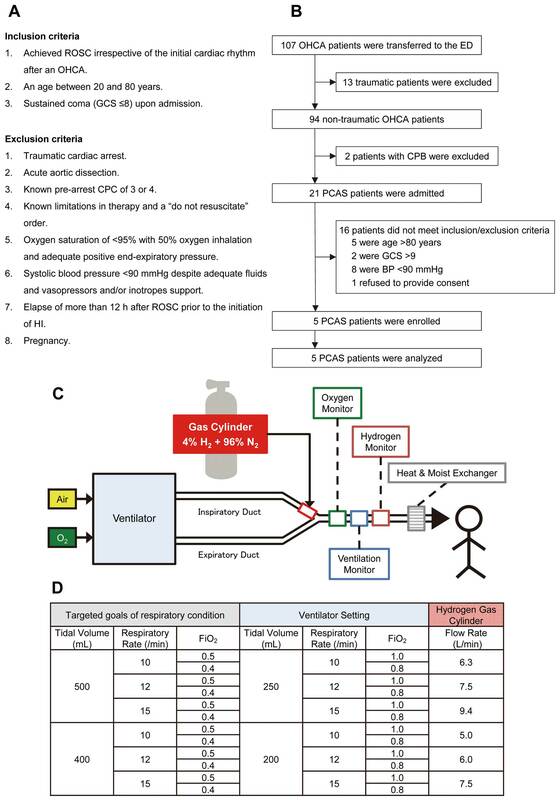 HI (2% H2 with oxygen) was initiated through a ventilator upon ICU admission and was continued for 18 h. During HI, patients were ventilated using volume-controlled continuous mandatory ventilation in combination with sedatives and neuromuscular blocking agents. The actual respiratory conditions, tidal volume, FiO2, end-tidal CO2, and H2 concentration was continuously monitored by additionally installed monitoring devices (Figures C,D). HI was successfully applied to all the eligible patients as scheduled. Predefined adverse events (AEs) were recorded daily until 7 days after CA, including cardiac re-arrest, atrial arrhythmia, ventricular arrhythmia, atrioventricular block, sick sinus syndrome, acute coronary syndrome, pericardial effusion, cardiac tamponade, in-stent restenosis, high blood pressure, low blood pressure, thromboembolism, vasculitis (arteritis/phlebitis), acute respiratory distress syndrome, ventilator-associated pneumonia, pneumonia, bronchitis, hypoxia, aspiration pneumonia, atelectasis, pleural effusion, intrathoracic hemorrhage, tracheal stenosis, gastrointestinal bleeding, ileus, ulcer, visceral arterial ischemia, ischemic colitis, diarrhea, liver failure, cholecystitis, cholangitis, pancreatitis, acute renal failure, chronic renal failure, pyelonephritis, cystitis, hematuria, loss of brainstem reflex, cerebral vascular disorder, seizure, myoclonus, limb paralysis, Stevens-Johnson syndrome, urticaria, edema, sepsis, septic shock, surgical site infection, catheter-related blood stream infection, anaphylaxis, falls, fractures, contusions, complications associated with the surgical procedure, and blood test values outside of the institutional reference ranges (Table S1). The Data and Safety Monitoring Committee reviewed all AEs and examined their causal relationships with events and HI, concluding that no AEs were causally related to HI. The neurological intact survival rates (ie, patients with cerebral performance category (CPC) of 1–2) were assessed at 90 days after CA. An outcome of CPC 1 had been achieved by 4 of the 5 patients. One CA patient with severe pneumonia and septic shock died of respiratory deterioration 22 h after the discontinuation of HI. To the best of our knowledge, this was a first-in-human study to evaluate the feasibility and safety of HI during PCAS care. HI did not interfere with PCAS care, including TTM. Although most AEs are of a potentially serious nature, they are often common in PCAS patients with or without HI. No AEs related to HI were observed. We concluded that HI is a safe and feasible procedure for patients with PCAS and thus can be considered as a novel therapeutic approach for PCAS patients. We sought to establish a safe method to administer titrated H2 gas through a ventilator. First, we chose a premixed gas of 4% H2 and 96% nitrogen (N2) to be mixed with oxygen so that the H2 gas concentration did not exceed an explosive threshold of 4% at room temperature. Second, we chose a specific kind of ventilator that uses an ultrasonic flow sensor (SERVO-i®; MAQUET Critical Care AB, Sweden) as the flow meters. Most of the available ventilators today are equipped with platinum hot-wire anemometers, which could overheat and ignite when the H2 is mixed. Thus the selection of the ventilator is particularly important. Third, to safely achieve the target of respiration, we had examined this H2 administration ventilator system and predetermined the patterns for the ventilator settings during the preclinical phase. We recognize several limitations. First, because the aim of study was to evaluate the feasibility and safety of the clinical translation of HI, the patients were highly selected. Second, the sample size was small, and further larger studies are required to confirm these results. However, it is well worth noting that the survival rate and the percentage of CPC 1 were 100% among the patients with a cardiac etiology, and even the PCAS patient with high neuron-specific enolase levels, which is a strong predictor of poor neurological outcome after OHCA, achieved a favorable neurological outcome after HI. Third, the duration of HI was restricted to 18 h because of the capacity of the gas cylinder. From our experience in patients with septic shock, prolonged HI may be desirable. HI in combination with TTM is a safe and feasible therapeutic approach for patients with PCAS. We are planning a larger, phase 2 clinical study to evaluate the safety and efficacy of HI for patients with PCAS (UMIN: 000019820). The authors thank Shuko Onuki for assistance with coordinating the research. This work was supported by a grant from the Japan Society for the Promotion of Science [grant no. 24390405] and Taiyo Nippon Sanso Corporation to S.H. 1. Soga T, Nagao K, Sawano H, Yokoyama H, Tahara Y, Hase M, et al. Neurological benefit of therapeutic hypothermia following return of spontaneous circulation for out-of-hospital non-shockable cardiac arrest. Circ J 2012; 76: 2579–2585. 2. Merchant RM, Soar J, Skrifvars MB, Silfvast T, Edelson DP, Ahmad F, et al. Therapeutic hypothermia utilization among physicians after resuscitation from cardiac arrest. Crit Care Med 2006; 34: 1935–1940. 3. Hayashida K, Sano M, Kamimura N, Yokota T, Suzuki M, Maekawa Y, et al. H(2) gas improves functional outcome after cardiac arrest to an extent comparable to therapeutic hypothermia in a rat model. J Am Heart Assoc 2012; 1: e003459, doi:10.1161/JAHA.112.003459. 4. Hayashida K, Sano M, Kamimura N, Yokota T, Suzuki M, Ohta S, et al. Hydrogen inhalation during normoxic resuscitation improves neurological outcome in a rat model of cardiac arrest independently of targeted temperature management. Circulation 2014; 130: 2173–2180. 5. Neumar RW, Nolan JP, Adrie C, Aibiki M, Berg RA, Bottiger BW, et al. Post-cardiac arrest syndrome: Epidemiology, pathophysiology, treatment, and prognostication: A consensus statement from the International Liaison Committee on Resuscitation (American Heart Association, Australian and New Zealand Council on Resuscitation, European Resuscitation Council, Heart and Stroke Foundation of Canada, InterAmerican Heart Foundation, Resuscitation Council of Asia, and the Resuscitation Council of Southern Africa); the American Heart Association Emergency Cardiovascular Care Committee; the Council on Cardiovascular Surgery and Anesthesia; the Council on Cardiopulmonary, Perioperative, and Critical Care; the Council on Clinical Cardiology; and the Stroke Council. Circulation 2008; 118: 2452–2483.